Thorne Air Conditioning and their associate Air Conditioning Sales would normally be obliged under these regulations to offer our domestic customers free take-back of their WEEE on a like-for-like basis when they buy a new Electrical or Electronic product from us. Unfortunately the costs of complying with this legislation force us to refuse to sell any of our goods to domestic customers who already own an identical item that they will require to be removed for disposal. We can however sell any selected item to a domestic customer providing that this item does not replace an existing identical like-for-like item that requires to be disposed of. For example, if a customer bought a new mobile air conditioning unit from us to replace an old original one, we would be forced to accept their old mobile air conditioning and prevent it going to a landfill site by disposing of it safely. The customer would also be required to return their unwanted like-for-like item to us within 28 days of purchasing their new item. 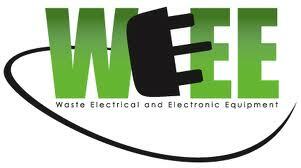 Under the WEEE Regulations, all new electrical goods should now be marked with the crossed-out wheeled bin symbol shown alongside.